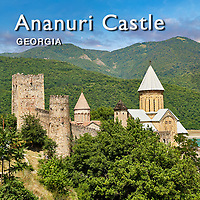 Pictures & images of the Ananuri castle complex & Georgian Orthodox churches, 17th century, Georgia (country). 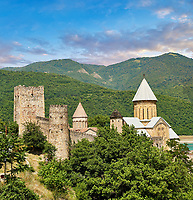 Ananuri castle is situated next to the Georgian Military Road overlooking the Aragvi River in Georgia, about 45 miles (72 kilometres) from Tbilisi. Ananuri castle was originally built in the 13th century as the seat and castle for the feudal Dukes of Aragvi who ruled the area. Its strong fortifications consisted of a high castle area with fortified towers with high curtain walls and a lower castle area much of which is ruins today. In 1739 the Dukes of Aragvi were massacred after the Ananuri castle was taken by the Shamshe family. They were deposed 4 year later and King Teimuraz II of the Bagrationi dynasty, was a king of Kakheti, eastern Georgia from 1732 to 1744, took control of Ananuri castle. 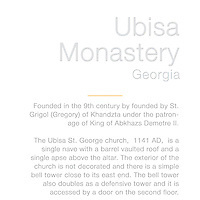 In the upper castle that we see today are two Georgian Orthodox churches. The oldest is the Church of Virgin, a cruciform church with a central Georgian style cupola and pan tiled roof. Its exterior has no decorations and inside are some graves of the Dukes of Aragvi. Next to the Church of Virgin is the The Church of the Assumption (Holy Mother of God), built in 1689. It is of cruciform layout with a high central Georgian style cupola clad in metal. The exterior of The Church of the Assumption is highly decorated with Georgian bas relief sculpture. It main portal has intricate geometric Georgian relief stone work and in its triangular tympanum are intricate stone carvings with Christ in a mondorla at its centre, and carvings of angels amongst intricate foliage stone carvings. Above the main door is a geometric stone relief of a crucifix which is the whole height of the facade. Either side of the crucifix are reliefs of the tree of life below which are reliefs of naive style angels. 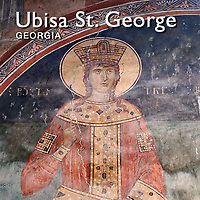 Inside The Church of the Assumption has many frescoes painted between the 17th and the 18th centuries some of which depict the Thirteen Assyrian Fathers who brought Christianity to Georgia. Between the two churches is a seemingly out of place tall thin tower in the style of those found in the Upper Sveneti region of Georgia. It has a stepped pyramidal roof. The ensemble of the Ananuri castle complex has been considered important enough for it to be inscribed In 2007 onto the UNESCO World Heritage Site tentative list. 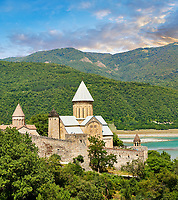 Download pictures & images of the Ananuri castle complex & Georgian Orthodox churches, or buy as photo art prints on line.